One problem every bike commuter must solve is where to store their bike and gear once they get to work. Even something like a helmet must be placed somewhere. You could either leave your helmet attached to your bicycle or perhaps bring it with by clipping it to your work bag. Well now there’s a third option. Helmet companies have created foldable helmets that are perfect for bike commuters. They allow you to arrive at your destination and fold your helmet up to be placed easily into most bags. No longer does carrying your helmet need to be a hassle! Yes. Foldable helmets are safe, and cannot be sold in most countries unless they pass the specific safety certification for that country. This is a good thing, because it ensures that companies are creating helmets that will protect people in the case of a crash. Every helmet on this list has passed various safety certifications so that they are safe for you to use. If you’d like to read more about helmet safety standards and when helmets expire check out this article. 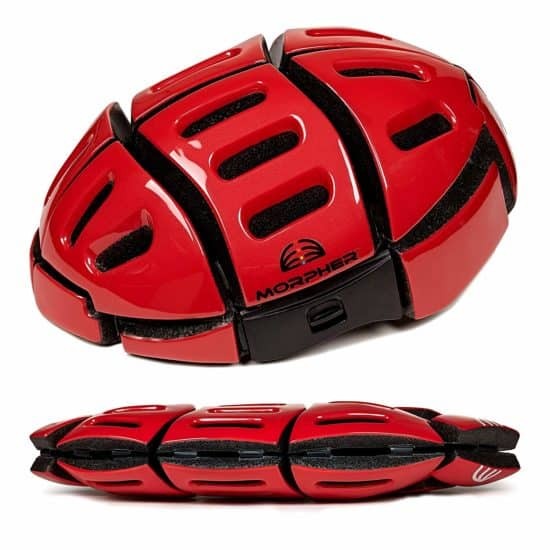 The Morpher foldable helmet is an awesome feat of engineering. This flat folding helmet folds down to 2.5″ thin so that you can tuck it into your bag when you’re done wearing it. 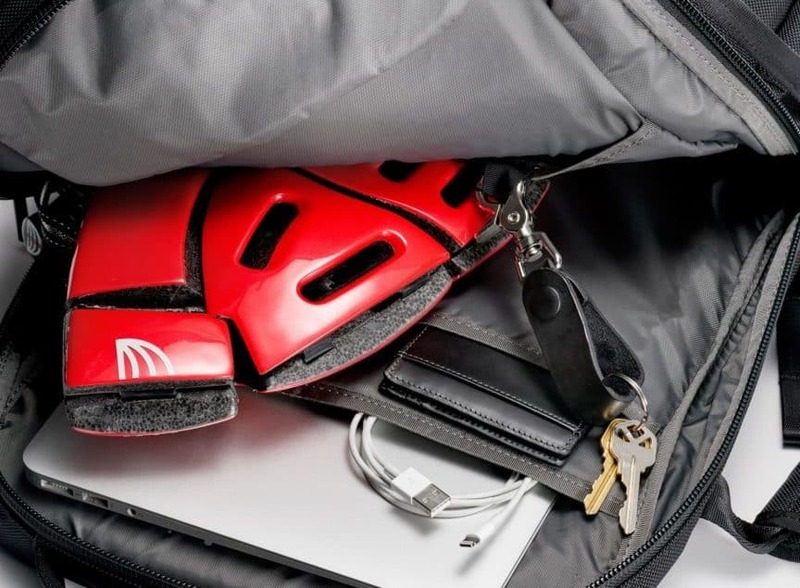 No longer will you need to clip your bike helmet awkwardly to your backpack, but instead you can tuck it inside. This helmet weighs less than a pound, and won’t add much weight to your load. The extra bonus is that these helmets look good. You would think that engineering a foldable helmet would give it a funky style, but this isn’t the case for Morpher’s helmets. They come in white, grey, black, red, silver, and yellow. Out of all the helmets on this list, I would give this my recommendation. The reasoning is that it’s comfortable, fashionable, safe, and folds into an insanely small size. If you’re reading this article, you’re looking for a helmet that truly folds, and the Morpher helmet does just that. It does the job on your head, and when you’re done you can easily pack it away until it’s needed again. The story of the Morpher helmet is interesting. The CEO Jeff noticed in 2011 that lots of people used his city’s bike share, but hardly anyone wore a helmet. Everyone was cruising around on bikes, but their heads were unprotected. 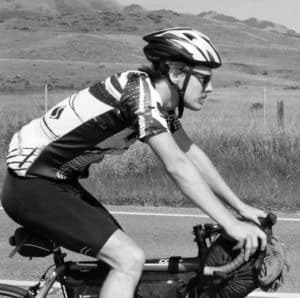 Jeff had experienced a bicycle crash, and his helmet likely was what saved his life. Every since that crash he’s been a huge proponent of wearing a helmet while riding. Noticing the lack of helmets worn by cyclists Jeff decided to research why this was the case. He discovered that one of the main reasons cyclists using the bike share didn’t wear a helmet was due to portability. People didn’t want to lug around a big helmet all day when they’d only wear it for a short time. With this knowledge, he launched one of the most successful Indiegogo campaigns raising $400,000 for the Morpher helmet. His goal was to create a helmet that was incredibly portable so that more people would be willing to wear a helmet, because it was easy to carry around. It took three years of engineering, designed, and developing, but the final outcome was the Morpher helmet. Will this helmet protect me? The Morpher helmet has passed the CPSC certification in the United States and the CE EN:1078 certification which is for the rest of the world minus Australia. Sorry Aussies! No Morpher for you, but the company says they’re working on getting the helmet certified for you soon. 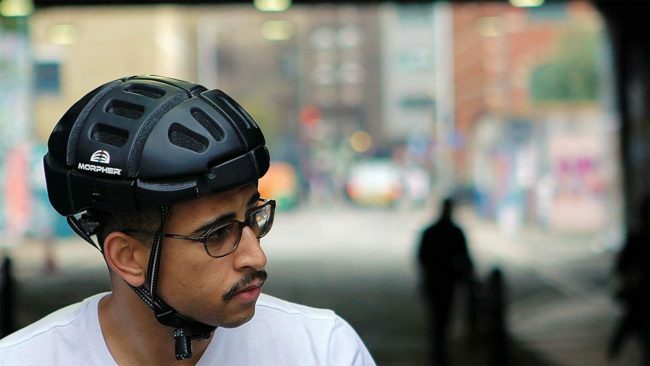 You can pedal trusting that this helmet will keep your head safe. 14 large vents to keep your head ventilated. 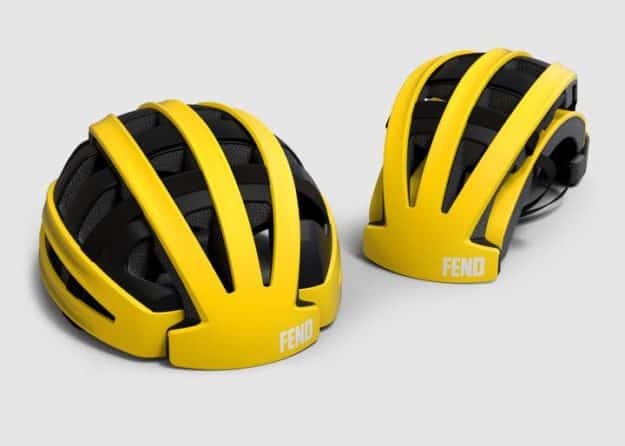 FEND’s folding helmet is designed so that the two sides slide inward to collapse the helmet. It folds by more than 60% to allow you to fit the helmet easier into your pack. It’s not quite as comfortable as a regular helmet, but still fits and feels good on your head. As you can see this helmet comes with LARGE vents for breathability. On warmer days you’ll have no problem keeping your head cool with this helmet on. As a bonus, the helmet comes with a nice carry bag. You can learn more about the FEND foldable helmet on their website. Brooks England has designed and manufactured a trendy foldable helmet that resembles something you’d see in a sci-fi movie. They’ve created an aesthetically pleasing helmet that will catch the eyes of others. Some users report that the white helmet is bright enough to grab the attention of others while riding at night. Not only did they go all in on the design, but they worked hard to not sacrifice comfort. The helmet has comfortable interior padding that can be detached and washed if needed. You can purchase this helmet in all the basic colors, but there are also a few other fashionable color arrangements to choose from. 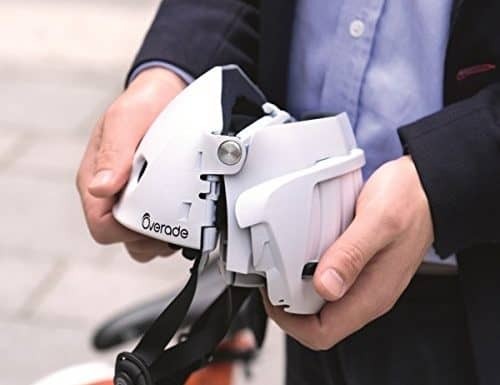 The only negative of this foldable helmet is that it reduces in size by only 20%. The sides slide inward to make the helmet smaller when not in use, but not nearly as much as other folding helmets. It’s a beautiful helmet that feels good on your head, but if you’re looking for a helmet that will take up little space after folding this isn’t the helmet for you. Closca chose a different approach to folding their helmet. 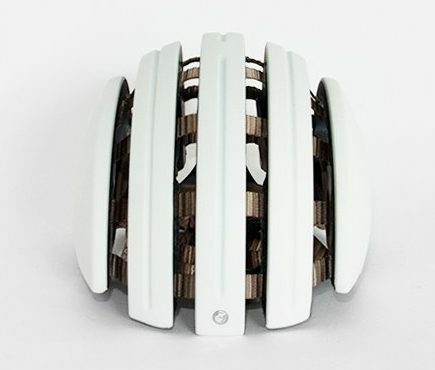 Unlike other helmets that fold in from the side, Closca’s helmet folds from the top down. Once it has been folded it is half of it’s expanded size making it easy to store. The round ringed vents help keep your head cool. Don’t worry about if folding why on your head, because it has a locking system to prevent that from happening. Closca offers mutliple visors that can be purchased with the helmet to keep the sun out of your eyes or add some extra style to your helmet. All in all, a great foldable helmet. Why are Folding Helmets useful for bike commuters? As a bike commuter you know that once you get to work or school you need to store your bicycle and gear somewhere. Perhaps you’re fortunate enough to be able to bring your bike inside, but for many commuters they’ll need to keep their ride locked up outside. Thieves are rampant in most areas and while a bicycle can be safe if locked properly, anything left on the bike isn’t. Which is why most people attach their helmet to a backpack or toss it into a bag. The issue is that helmets take up space. This is where foldable helmets are useful. Once you show up to your destination you can quickly fold up your helmet to store it easily into whatever bag you’ve got with you. Folding helmets are great for bike commuters. Should I keep wearing my foldable helmet after a crash? Yes. Anytime you crash in any type of helmet it’s time for it to be retired. Even if you don’t see cracks or a dent in your helmet, it doesn’t mean that the helmet is compromised. Helmets are made to undergo a single crash and not multiple ones. A company will not stand behind one of their products that has already been crashed in. The reason is that helmets are made of a foam material that absorbs impact.Helmets are not created to undergo mutliple impacts. Once you’ve crashed in a helmet (even if it’s foldable) you need to get a new one. How can I wash my foldable helmet? You shouldn’t use abrasives or industrial strength cleaners on your helmet. Simply use a damp cloth with water and soap to wipe it down if it’s sweaty or dirty. 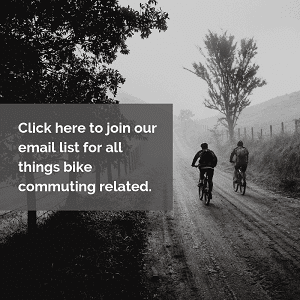 Many bike commuters own a personal bicycle that they use to get around, but not everyone owns a bike. Many bike commuters use bicycles from bike share programs in their city to commute. 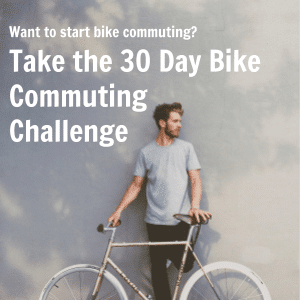 Part of their commute could be by train, bus, or metro and than the rest could be on a bike share bicycle. A foldable helmet can be beneficial for commuters like this as they don’t have to carry a bulky helmet with them everywhere. A nice foldable helmet can be stowed away until the portion of their commute where it’s needed. I believe that we’ll see a variety of foldable helmets in the future as more companies design their own foldable helmet product. Clearly there is a huge market for these types of helmets, and right now there are only a few companies producing them. 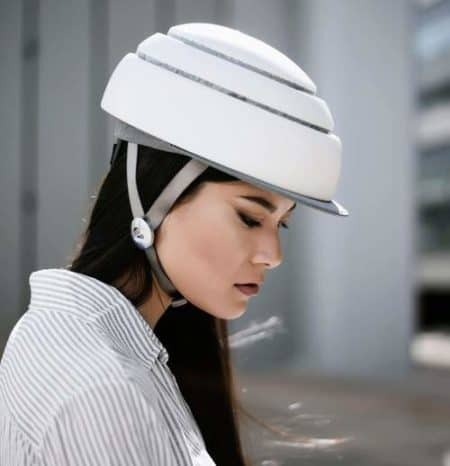 As seen by the collection of foldable helmets in this article these types of helmets are safe, fashionable, and take up little space. Get yourself a fordable helmet today and enjoy your bike ride!